As a law professor, I engage in scholarship and I teach students. The two aspects are intricately intertwined for me. My teaching is the better for my scholarship and my scholarship is the better for my teaching. My students, individually and as groups, have raw smarts, dedication, and – almost aways – good humor and joy. Jefferson Beauregard Sessions cannot impair my students’ intelligence or their capacity for hard work. But he can, especially for my black students, interfere with their good humor and joy. That is a sin, a shame, a scandal. Any American with Jefferson Beauregard Sessions’ record on racial justice – civil rights, voting rights, ballot access – simply does not understand and certainly does not care about legal justice in the United States of America. It is intolerable to me that my black law students have to put up with their government officially embracing white supremacism in the United States of America Department of Justice – in the cabinet office for justice! – in 2017. These young women and men have come to study law, the vehicle for operationalizing justice in our country, here in Washington, DC. Now, right around the corner, sits a DOJ headed by a man who demonstrably fails to comprehend legal justice in the U.S. context. How can that not rob them of joy and good humor? They are robbed. But joy and good humor can be salvaged and revived even in grueling circumstances. This I do know. I cannot, individually or immediately, change the personnel in the White House, the Department of Justice, or the Congress. I most certainly can, right now, stoke the enthusiasm of all my students, and especially my black students. I can laugh with them, make them laugh. I can show them the beauty and majesty of law and teach them about the women and men in law who are the antithesis of all that is wanting in Jeff Sessions. I can notice the grace and aplomb shown by my black students in these trying times and applaud them for it. By cultivating the joy and good humor my black law students carry within themselves, I will be the lucky one. My efforts to bolster their reserves in the face of this wretchedly painful time for legal justice in the U.S. will fortify my own enthusiasm, my own higher spirits. With all my students, but especially with my black students, we will together use our smarts, our tenacity and our great high spirits to further our knowledge of law and to build legal justice in this country and beyond. Yesterday, in the course of speaking against Jeff Sessions’ appointment to the post of Attorney General, Senator Elizabeth Warren attempted to read into the record testimony originally given by Coretta Scott King in opposition to Sessions’ 1986 appointment to the federal bench. The Senate Majority leader, along with all other Republican Senators in attendance, refused to permit Senator Warren to finish her remarks, banishing her for allegedly inappropriately insulting a fellow Senator. Details of this episode here. In short, a woman, using other another woman’s words, to question a man was told, by a man, to shut up. Today four male Democrat Senators read from Mrs. King’s testimony in the ongoing debate of Sessions’ suitability as Attorney General. They were all permitted to speak. The Senate Republicans may have prevented Senator Warren from entering Mrs. King’s words into the record, but they cannot prevent other women from entering those words into public discourse. 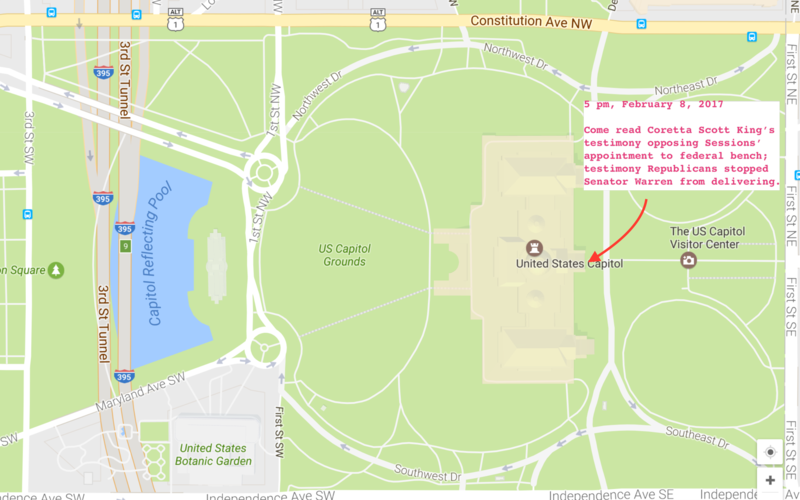 Tonight, beginning at 5 pm at the Capitol Building, on the South side of the Senate building, women – and men – are invited to join in reading aloud the testimony of Coretta Scott King regarding Jeff Session’s fitness to uphold civil rights for all Americans. This will be a peaceful gathering of ordinary people, assembling to exercise their rights under the First Amendment of the United States Constitution.